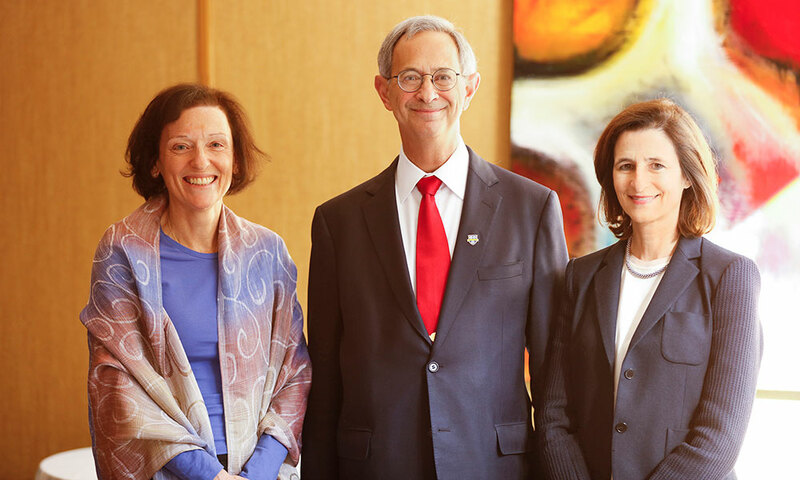 Trustee Barbara J. Burger, University President and CEO Joel Seligman, and Mary Ann Mavrinac, vice provost and Andrew H. and Janet Dayton Neilly Dean of River Campus Libraries. University of Rochester Trustee Barbara J. Burger, Ph.D., has committed $1 million to the River Campus Libraries for the creation and implementation of the iZone, a collaborative, technology-rich space that will provide students with programs, services, and resources to explore their ideas and develop innovative projects for social, cultural, community, and economic impact. Upon completion of the iZone project, the space will be dedicated as the Barbara J. Burger iZone at the River Campus Libraries. Located on the ground floor of Rush Rhees Library, the iZone will include collaborative workspaces, consultation and team rooms, exhibition areas, and computer workstations where students from all disciplines can meet with like-minded peers. Students will benefit from a community of experts—including faculty members, librarians, local business leaders, and entrepreneurs—with whom they can consult for assistance in developing their ideas. The iZone’s programs will help students become better prepared to participate in activities offered by the other innovation-focused groups on and off campus. Pilot initiatives include an entrepreneurs-in-residence program; professional development workshops; and a match-making program that connects students with services, mentors, and project partners. The River Campus Libraries will partner with the College, the Ain Center for Entrepreneurship, the Gwen M. Greene Career and Internship Center, Ronald Rettner Hall for Media Arts and Innovation, University Information Technology, and a variety of student groups. The iZone will also create opportunities for students to engage with the City of Rochester community and area organizations, such as High Tech Rochester. Burger is president of Chevron Technology Ventures, an organization focused on identifying and integrating into Chevron innovative, externally-developed technologies that yield strategic and financial value to the corporation. She joined the company in 1987 as a research chemist and held numerous executive leadership positions in International Marketing, Chemicals, Technology Marketing and Lubricants before being appointed to her current role in 2013. Burger is an active member of the Chevron Executive Women’s Network and enjoys mentoring mid-career employees. She also serves on the board of directors for the Houston Technology Center and the Houston Symphony Society and is a member of Houston’s Committee on Foreign Relations, in addition to working with several foundations. Burger graduated from the University of Rochester in 1983 with a bachelor’s degree in chemistry. She went on to receive a doctorate in chemistry from the California Institute of Technology in 1987 and an MBA in finance from the University of California, Berkeley in 1994. In addition to her service on the University of Rochester Board of Trustees, she is a member of the River Campus Libraries National Council, the Texas Regional Cabinet, and is a founding member of the San Francisco Bay Regional Cabinet. She is also a charter member of the George Eastman Circle, the University’s leadership annual giving society, and previously established an endowed scholarship in the sciences at the University and has supported the chemistry department and athletics. In 2013, Burger received the University of Rochester’s John N. Wilder Award in recognition of philanthropy that inspires others to support the pursuit of an “ever better” University.